Putting a CMMS/EAM solution in place can seem like a daunting task. The MPulse AIP is specifically designed to accelerate your software implementation and reduce your rampup time. By combining business process consulting with software implementation and a custom-designed training curriculum, the MPulse AIP minimizes disruptions and helps you achieve a faster return on investment. This comprehensive initial training program provides pre-training data import and configuration consulting as well as customized on-site training. Discover how AIP gets you through planning, data migration, installation, training, and “go-live” day. 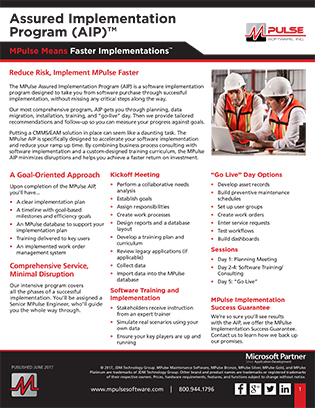 The MPulse Assured Implementation Program (AIP) is a software implementation program designed to take you from software purchase through successful implementation, without missing any critical steps along the way. Our most comprehensive program, AIP gets you through planning, data migration, installation, training, and “go-live” day. Then we provide tailored recommendations and follow-up so you can measure your progress against goals. Putting a CMMS/EAM solution in place can seem like a daunting task. The MPulse AIP is specifically designed to accelerate your software implementation and reduce your ramp up time. Our intensive program covers all the phases of a successful implementation. You’ll be assigned a Senior MPulse Engineer, who’ll guide you the whole way through. We’re so sure you’ll see results with the AIP, we offer the MPulse Implementation Success Guarantee. Contact us to learn how we back up our promises.